The blood, the characters of which have just been considered, circulates through the body by the agency of the heart and blood-vessels. The heart is a portion of the vascular system, consisting of a compact but hollow mass of muscle that acts rhythmically as a pump, and, owing to the presence of valves suitably placed, drives the blood in one constant direction through the body. It is placed in the thorax or chest, and is protected from injury by the breast-bone and the firm but elastic ribs and spine, and also owing to its being enveloped to a large extent by the spongy tissue of the lungs. It is enclosed in a tough membranous bag named the pericardium, lined internally by a serous membrane, the smooth and polished surfaces of which, moistened with the fluid they secrete, reduce friction to a minimum. The general course pursued by the blood is from the heart, through the arteries and their ramifications, named capillaries, onward to the veins, by which it is again conducted to the heart. Although in appearance single, the heart is really a double organ, the two parts being united for the sake of economy of space and material, and also to enable them to work equably and simultaneously. One of these hearts, the right, forces the blood through the pulmonary artery to the lungs, from whence, by the pulmonary veins, it returns to the left heart. The right heart is therefore called the pulmonary heart, and is the effective agent in the lesser or pulmonary circulation. The left heart is by far the stronger of the two hearts, and drives the blood through the aorta and its branches over the system at large, from whence it is returned to the right heart by two large veins (venae cavse). Hence it has been named the systemic heart, and is the main agent in effecting the greater or systemic circulation. The right heart forces dark or venous blood, charged with carbon dioxide, through the lungs, where, becoming aerated by losing that gas and absorbing oxygen, it returns to the left heart as bright or arterial blood, and is distributed to the body generally. The heart as a whole weighs about 7 lbs. Its length is about 10 inches, and its width at the base about 7 or 8 inches. 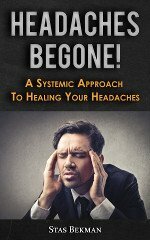 It is of conical form, the base being directed to the spine. The capacity of each cavity is estimated to be about 1 1/2- pint. The heart is composed of a form of muscular tissue intermediate between the striated and unstriated. The external or superficial layers run obliquely over both ventricles; the inner or deeper layers are confined to the right and left ventricles respectively. Each heart presents two cavities, an upper one, named the auricle, and a lower one, named the ventricle; so that there are two auricles and two ventricles, or four cavities in all. The right auricle receives the two venae cavee or large systemic veins above, and opens by a wide orifice into the right ventricle below, the aperture being guarded by the tricuspid valve. 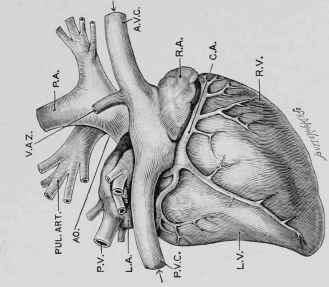 From the upper part of the right ventricle the pulmonary artery arises, the orifice of which is also guarded by the three semilunar valves. A similar arrangement exists on the left side. The pulmonary veins have no valves. 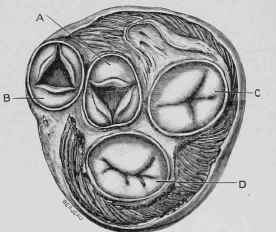 They open into the left auricle above, and this communicates by a large orifice, guarded by the bicuspid valve, with the left ventricle below. 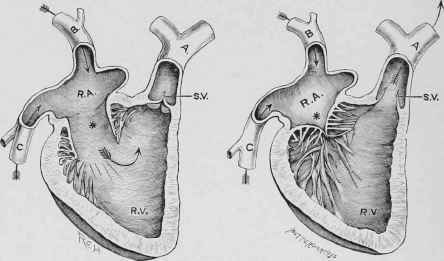 From the left ventricle arises the aorta, the orifice of which is also guarded by three semilunar or sigmoid valves. Fig. 187. - Horse's Heart, Left Side. Fig. 188. - Horse's Heart, Right Side. L.A., Left Auriele. R.a., Right Auricle. L.v., Left Ventricle. R.v., Right Ventricle. AO., Aorta. ANT. A., Anterior Aorta. P.A., Posterior Aorta. PUL. ART., Pulmonary Artery, c.a., Coronary Artery. a.v.c, Anterior Vena Cava. P.v.c, Posterior Vena Cava. P.v., Pulmonary Veins, v.az., Vena Azygos. 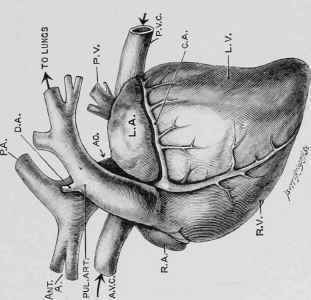 D.a., Ductus Arteriosus Botalli. Figs. 189 and 190. - Diagrammatic Views of the Heart, showing Valves open and closed. A, Pulmonary Artery. B, Posterior Vena Cava. C, Anterior Vena Cava. B.A., Right Auricle. * Auriculo-Ventricular Opening (open in the first figure and closed in the second). R.V., Right Ventricle. Course of Blood. s.v., Semilunar Valves (closed in the first figure, open in the second). The heart of the horse beats in health about forty times in the minute. The order of succession in the contraction is that the two auricles beat simultaneously, and then the two ventricles. Then there is a pause. The duration of the contraction is nearly the same as the pause. The contraction of the heart is named the systole. During the systole the whole heart becomes shorter and more conical in form, and twists a little upon its long axis towards the right. This contraction of the heart commences above at the opening of the great veins, which, being here surrounded by muscular bands, nearly close, and thus greatly impede, but do not altogether prevent, the backward flow of the blood from the heart into the venous system. From the great veins a wave of contraction instantly spreads over the auricles, driving the blood they contain through the auriculo-ventricular valves into the ventricles, which, already containing a little blood that has gravitated into them, are now distended to the utmost. There is no appreciable interval between the contraction of the auricles and that of the ventricles, but the wave of contraction continuing, without stay or stop, to spread from the auricles, makes the ventricles close upon their contents. The first effect of this is to raise the auriculo-ventricular valves and approximate their edges, and thus to prevent any return of blood into the auricles. The next is to propel the blood contained by the ventricles into the pulmonary artery and the aorta, for distribution through the lungs in the one case and over the general system in the other. In so doing the blood forces open the semilunar and sigmoid valves in these vessels and compels the whole mass of blood to move onwards. But as the column of blood resting on the valves just before they are forced open is quiescent, a brief period is required to overcome its inertia, and a remarkable provision against the jar that would otherwise be felt through the body, from the vigour and suddenness of the heart's systole, is found in the elasticity of the coats of the large vessels. Whilst, then, a part of the heart's force drives the blood forwards, a part is expended in dilating the arteries. As soon as the contraction is completed, relaxation immediately follows, and the heart passes into the state of commencing dilatation. The great vessels into which the blood has been forced now retract, and the first effect is to close the semilunar valves, and thus to prevent the return of the blood into the ventricles, whilst the next is to compel the onward movement of the blood in the vessels; the elastic reaction of the stretched walls restoring to the circulation during the diastole the force temporarily borrowed from the heart. The wave which is produced by the injection of blood into the vessels when the heart contracts is the pulse, but the closure of the semilunar valves is so sudden, and follows so immediately upon the contraction, that a reflex wave from the valves succeeds the main systolic wave and forms a part of the pulse. This is known as the dicrotic wave. Fig. 191. - Section of the Heart, showing the Valvular Apparatus. A, Aorta. B, Pulmonary Artery, c, Mitral Valve. D, Tricuspid Valve. If the ear be applied to the chest two sounds may be heard to accompany the action of the heart; the first is dull and prolonged, the second is shorter, sharper, and ends abruptly. The first sound owes its origin mainly to the sudden tension of the auriculo-ventricular valves in the right and left hearts, but is almost certainly intensified by the muscular sound of the contracting ventricles. The second sound is exclusively due to the sudden tension of the aortic sigmoid, and pulmonary semilunar valves which guard the orifices of the aorta and pulmonary artery respectively. Both sounds are therefore valvular, and any rent, or inequality, or imperfection in the valves, permitting the blood to flow in the wrong direction, or causing friction, as in heart disease, causes alteration in the characters of the sounds easily recognized by the practised ear. The frequency of the beats of the heart is increased by exercise, by food, and by mental emotions. They are more frequent in the morning than at night, in the young than in the old, and in the female as compared with the male.